It’s been months, has it? Well, I guess it has, and while I feel guilty for having let this splendid forum remain blank all this time (and for months before that using it for little more than posting installments of Spy Rock Memories), I have actually been fairly busy. Which, of course, was completely true, so that was enough to stop me complaining, at least to other people (I can still occasionally be heard muttering to myself, but then I’ve been doing that for years, regardless of whether things were awesome or abysmal). However, as of late it almost feels like everything is coming up Livermore (with a couple exceptions that are too inconsequential and/or hopeless to bother mentioning here). First off, though I believe I’ve mentioned it here before, it’s now official: Spy Rock Memories is coming out as a book, in both printed and digital form. The precise publication date hasn’t been set yet, but it looks to be sometime this spring, and once the book is out, I expect to be setting out for several months of traveling to various bookshops and cultural centers around this great land to promote it. No definite schedules yet, but I especially look forward to visiting as many towns as possible around the Emerald Triangle and in Northern California. Anyone who has suggestions for bookstores or other worthwhile venues is welcome to get in touch. 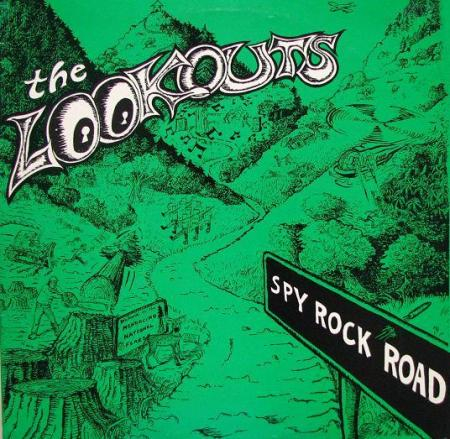 Almost simultaneously, the songs of my old band, the Lookouts, almost all of which have been out of print for 20 years or more, are being reissued, on a double LP as well as digitally. One of the records will be the original Spy Rock Road, which we released in 1989, and the other will contain our 7″ and compilation tracks, which adds up to another 13 songs. Tentative title for the package is Spy Rock Road and Other Stories. We’ve been urged to re-unite for a show or two to help properly launch the record, but as usual, our drummer finds himself very busy with his new band (the one he joined in 1990), so the likelihood of that happening any time soon remains in doubt. Cover to the original Spy Rock Road album; the re-release will contain a second record and 13 additional songs. Right about the time the decision was reached to bring the written and musical versions of Spy Rock to the world at large, I received a call from Billie Joe Armstrong, who asked if I’d be interested in putting together a compilation of my favorite punk rock and pop-punk bands for his Adeline Records label, and though my initial reaction was, “Oh no, how am I supposed to find time to do that, too?” it was too exciting an offer to refuse, so I said yes, and it turned out – thanks to modern technology, much of which didn’t exist when I was last putting out records – that within a couple months I had not only rounded up 16 outstanding bands, but also got them into the studio, and bingo, just like that, we have a compilation: The Thing That Ate Larry Livermore. 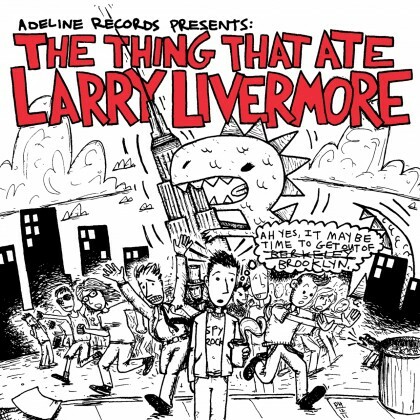 Old-timers among you will of course recognize the allusion to the 1988 Lookout Records classic compilation, The Thing That Ate Floyd. Patrick Hynes artwork for the new compilation. Hoping to remain true to that spirit, I recruited my old Lookout Records (and Potatomen bandmate) Patrick Hynes to do the cover artwork, and while it’s true we recycled the concept from an old issue of Lookout magazine, I think it came out fantastic, and am looking forward any day now to see the back cover, which is likely to be equally amazing. Release date is also sometime this spring; in fact we’re shooting for early April right now. I’ve posted the names of the bands elsewhere, but what the heck, I might as well do it again: Dear Landlord, Mixtapes, Lipstick Homicide, Dopamines, House Boat, Vacation, The Max Levine Ensemble, Emily’s Army, Mean Jeans, The Hextalls, Weekend Dads, City Mouse, Be My Doppelganger, Night Birds, The Copyrights, The Visitors. Quite a list, wouldn’t you agree? Unless, of course, you don’t follow this particular style of music, in which case you’re probably reading off the names with a glassy-eyed stare as you wonder what if anything it all means. That digression aside, one of the worst aspects of not keeping up with the blog these last few months is my having neglected innumerable opportunities to comment on what has taken shape as the most ludicrous and pathetic political campaign in my memory, and is only likely to get worse. When I was a kid I was inordinately fascinated by the Roman Empire, what went wrong with it, and what we could learn from its demise to prevent America from stumbling down a similar path. If you read Gibbon – which I did, albeit only partially – one thing that strikes you is that in Rome’s latter days it was afflicted with a succession of ever more corrupt, weak-minded and idiotic emperors. There were other parallels to our present-day situation – squandering the imperial treasury on futile and pointless colonial wars, the wholesale abdication of responsibility on the part of both the ruling class and the general citizenry, the substitution of cults and mysticism for reason and discipline – but given the clown show of candidates the Republicans have managed to come up with, and given that it’s far from unthinkable that one of them will become president, precipitously declining standards in public life just might be our biggest single threat at this point. I recognize that many people – myself included – are disappointed in Obama, feel that he has been too sympathetic toward the corporate class and too willing to compromise with the lunatic fringe of the Republican Party (is it fair, though, to call it a fringe anymore, now that there’s little left to the Republican Party but a lunatic fringe? ), but even seen in the worst possible light, Obama remains a rational, intelligent person who adheres to at least some basic principles (we don’t have to agree with those principles to recognize that they are in fact principles). So it bewilders me when many of my friends and fellow left-of-center types are ready not only to abandon Obama, but to work actively against him. As I said, I understand and share your disappointment, but I can’t conceive of a single scenario under which our lot would be improved by replacing him with someone almost infinitely worse. It was a similar logic that gave us George Bush in 2000: because Al Gore was insufficiently progressive for many of us, we instead allowed one of the most disastrous presidents in history to be installed, and I believe the jury is still out on whether the country will ever recover from the damage Bush and his cronies did to it. You’d think the fact that every single Republican candidate this year is more extreme than Bush – not to mention, in the case of most of them, more intellectually and morally deficient – would give people pause before they take any action to increase the chances of one of them getting into office, but you would in fact be wrong. There are those, of course – I know, because at times in the past I’ve been one of them – who cling to the belief that things need to get worse in order to prompt the full-fledged revolution that we need, but this thinking ignores both history – most revolutions take place when things are already beginning to get better, not when they are plummeting toward their worst – and common sense. The USA is not – the admirable efforts of Occupy Wall Street notwithstanding – in a pre-revolutionary situation. It is more likely to be in danger of imminent collapse. Perhaps I’m getting a bit carried away? I spent most of my younger years in fear of an apocalypse that never arrived, and it’s perhaps a bitter irony that just when I had reached a state of tenuous accommodation – i.e., accepted the supposedly more “grown-up” notion that most of the time things were neither as awful nor as outstanding as they appeared – that the actual end times might be arriving. Not everywhere, of course: many parts of the world, including some that I’ve visited this past year, seem to be doing just fine, and doing so by following policies that are precisely the opposite of those being advocated by Republican extremists and too easily acceded to by Democratic moderates. But enough of that: we’ll survive – or not – and life will go on – or not – and hopefully you’ll all be sufficiently untouched by the impending havoc that you can still afford to buy my upcoming book and records. Personally I’m debating whether to stop paying attention to politics altogether. It’s childish and irresponsible, I know, but I get so wound up and agitated whenever I watch these people lying on a prodigious scale and/or giving vent to paranoid flights of fantasy. The chances that my opinions, no matter how vociferously expressed, will have any impact on the political climate or its outcome are slim, and I’ve also got a couple more books to write (subject matter to be revealed in the upcoming months) before I get too terribly much older. On the mostly plus side: it’s the middle of winter and we’ve had a spate of shirtsleeve and light jacket weather more appropriate to March or even April than January. I only put it on the “mostly” plus side because it makes it very hard to stay indoors and do the massive amounts of work I seem to have signed up for. Happy New Year, everybody, and let’s hope it’s not nearly as long before we meet again! How about a visit to Reading Frenzy in Portland when you make your tour? Glad to see the Mean Jeans on your list! yea you lived in Laytonville. You sound like a more defined James Taylor Jones. 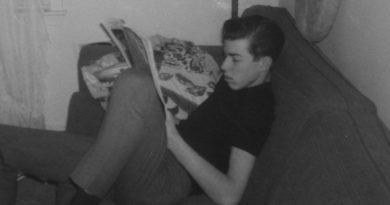 in the current Laytonville paper. I love it! I only get a copy every so often sent to me, but I do try to read it. Glad to hear about the book and record deal. Will look forword to each. Peace/Love, as JTJ would say. PS you do need to put in a Laytonville stop on your tour. They have a great Mexican rest. there, besides there’s the ‘Chief’. I’m positive there is no book store in Laytonville. The Willits and Ukiah books stores would be happy to have you I’m sure. I’ll definitely come by for a signed copy. But before I do will you be publishing how this story ends or will we have to by the book to find out? Chapter 12 (the final one) still needs a little tweaking before it’s ready to post or print. The question is, should I put it up here on the website, or leave everyone in suspense so they’ll be more likely to buy the book? The plan always was to post it here, but now I’m not so sure… Oh, but I probably will. Obama may be a “rational, intelligent person,” but that doesn’t mean he has the slightest idea what he is doing with respect to the economy. Ron Paul, a member of your “clown show,” seems to be the only one from either side of the aisle who understands that printing trillions of dollars out of thin air cannot result in real economic growth (but will, however, benefit those with first access to it immensely). The only thing that matters is who controls the money supply (the Federal Reserve). Everything else is designed to throw up dust. If you took a moment away from your platitudes and teenage idealism to investigate this, your entire world would change. I’m sure Billie Joe and Mike would give Tre the day off to play a show with the Lookouts (after all, both of them have found time to play on side projects while in Green Day). Besides, Billie needs to come on stage to play lead guitar on the ‘IV’ songs! End the Fed! I am not a crackpot! kate wolf festival on jun 29/july 1, lots of spy rock locals there. I disagree on Obama, because I just don’t see much of a difference anymore. But I love Spy Rock, and I can’t wait to buy your compilation! By the way, it’d be cool if you stopped at City Lights in North Beach, though you may just want to hit up Northern California. Laughing Dogs book store in Boonville. It might not be Laytonville but it’s still Mendo County. Glad to hear you are happily busy, and will(probably) post the last installment here. I do intend to buy your book anyway, since it is important to support less well known writers, as well as a book one can dip into, now and then. In over 40 years of voting I have always voted, and never for a Republican or an Independent, even when very young, mainly because I thought that would cause the worst candidate to be elected. Hoever, President Obama no longer seems worse than George Bush since he signed the defense reauthoriozation bill. That was the final straw. After years of writing and calling the President and my elected senators and representatives, as well as demonstrating, I pulled my support, including financial. If he/they rescind the provisions in the bill, and start listening to those that elected them, I will change my mind. I have never wanted a revolution, even during my hippie/freak college years. I.e., I am not a radical, but one of the mainstream. There are some lines I just can’t cross. anything new on the tour, book and record, and on chapter 12?